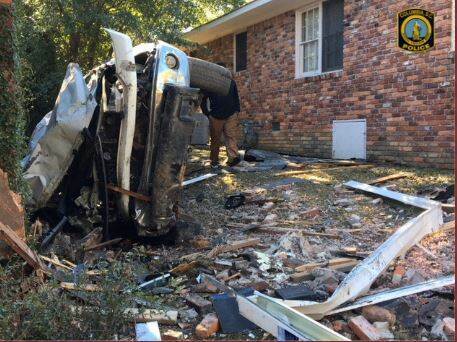 The Columbia Police Department’s (CPD) Traffic Safety Unit is working to identify a male driver who crashed a stolen vehicle into a home near Two Notch Road. 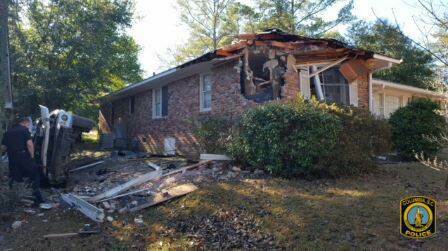 The collision occurred at approximately 11:00 a.m. today at a home on Stepp Drive. Initial information indicates that a CPD officer witnessed the suspect driving erratically in the area and initiated a traffic stop with blue lights and sirens. Instead of stopping, the driver attempted to leave the area and crashed into a house, causing significant damage to it and a neighbor’s home. Residents were inside each of the homes but were not injured. a Toyota Tundra was reported stolen from the Richland County Sheriff’s Department’s jurisdiction. The driver likely sustained injuries but managed to get out of the vehicle and leave the area on foot. 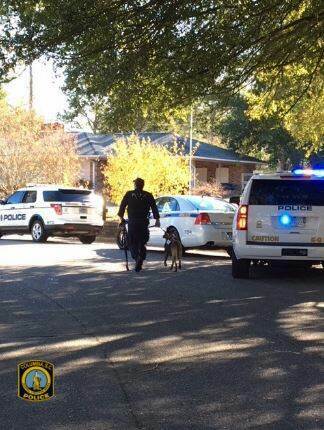 CPD K-9 Teams searched for the suspect but was not able to locate him. CPD is investigating to determine the suspect’s name. In the meantime, CPD has asked the South Carolina Highway Patrol (SCHP)to investigate the crash portion of the incident. DOWNLOAD the new P3 Tips App for Apple or Android device.